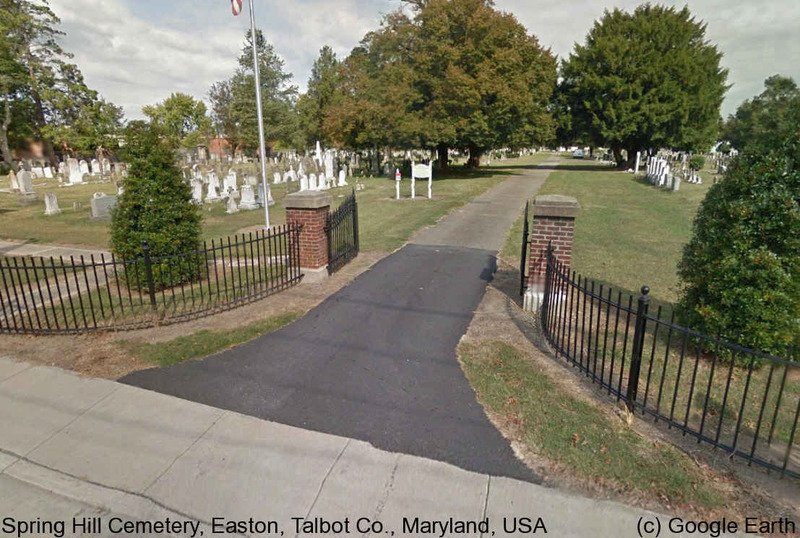 The first known burial ground in the original town limits of Easton was the land surrounding the Methodist Episcopal Church that had been built in 1790. This Church, the first church to be built in this newly laid out town, stood on the north side of Goldsborough Street, between Thoroughgood Lane and Aurora Street. In 1802, occupying a light rise in the ground at the north end of Harrison Street, was land that could be purchased by subscription for the use by “several denominations of Christians, strangers and people of color” as their burial ground. At this time, the Episcopalians were still using the lands adjoining the Old White Marsh Church in Trappe as their cemetery. In 1827, Dr. Ennals Martin gifted land west of the main gate of Spring Hill Cemetery to the Vestry of Christ Episcopal Church to be used as a burial ground. His son, Bartholomew Ennals Martin, was the first person to be buried in this part of the graveyard. Twenty years later, in 1847, the Methodist Episcopal Church added to their Spring Hill Cemetery holdings by buying the property on the east side of the main gate. For years, these cemeteries were maintained separately, but by 1877, they had merged. The cemetery was then expanded by the annexation of the north end and by the addition of several acres owned by Colonel Samuel Hambleton. At this time the cemetery was enclosed for the use of all faiths and called Spring Hill Cemetery, from a spring located nearby. With the decline of services at Old White Marsh Church, many of the remains interred there were moved to Spring Hill, as were many others from private home plots. Some of these date back to the early 1600s. With the exception of the Quakers, who had their own burial ground at Third Haven Meeting House, almost every family in the County as well as the Town of Easton was represented here. After World War II, the annexation of property farther north on Aurora Street enlarged the cemetery to more than 25 acres. There are now more than 10,000 graves in the cemetery.